MN West Ag provides clients with an extensive array of reports.Detailed reports for each crop include estimated production, estimated cost of production, crop insurance impact, mark to market revenue, position graphs, options & futures, insured bushels sold, delivery and revenue schedules and more. MN West Ag advisors input the individual clients data into the software and work with the farmer to update the information as appropriate. Working with the client the advisor monitors yield expectations, production costs , crop sale, and any futures or option positions. The information is entered into the program to instantaniously generate updated reports as part of the position manager sales reports. The client has access to the "MNWestAg Position Manager" software and reports in a number of ways. The MN West Ag advisor can print the report and provide a hard copy to the client,a PDF file of the report can be emailed to the client, in addition the client can choose to have access to the software. If the client chooses access to the software a sharing and synching program is used so that any changes or updates the advisor or client makes automatically takes place for the other user. 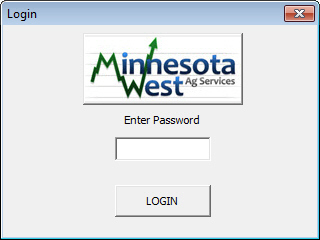 MN West Ag uses a password protected sotware program "MNWestAg Position Manager" to protect the clients data. The "MNWestAg Position Manager" is maintained by the MN West Ag Advisor but also can be shared with the client using a program that automatically updates the information when changes are made by either the advisor or client. The program is available during the entire time of the clients subscription term. The information and reports are available to be printed to a hard copy or saved to a PDF file until a client chooses to end the subscription. After that time the client will no longer be granted access to the program and any copies will be unaccessable.